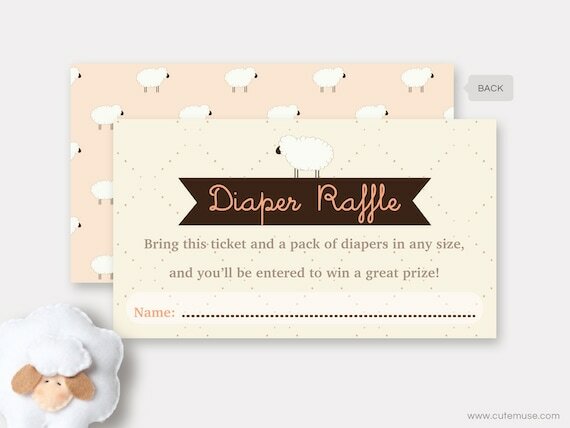 Little Lamb Diaper Raffle Ticket Printable for Baby Shower Game is perfect for helping the new mother get lots of diapers by throwing a "Diaper Raffle" at the baby shower while you are having fun. The backside of the raffle tickets is a cute 'lamb pattern' on a light peach background color. • 1st page: 12 Diaper Raffle Cards on a 8.5" x 11" page. - Size: The raffle cards are 3,5" x 2" / the same size as business cards. • 2nd page: The backside for the Diaper Raffle Tickets.